Get a fast, cost-efficient Web browsing experience. Use our powerful servers to compress data by up to 90% before sending it to your iPhone, so page-loads are lightning fast. Opera Mini is a breeze to use, and can synchronize data between your phone and computer. Some great features of Opera Mini: Speed: Up to 6 times faster browsing, especially on slower or crowded networks. Data Savings: Compress up to 90% of data traffic. Speed Dial: Get to your favorite Web sites with a single tap. Visual Tabs: See all your open Web pages and quickly switch between them. 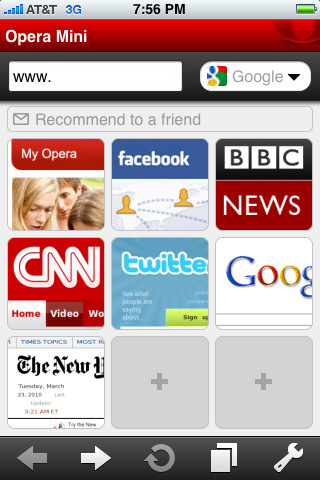 Opera Link: Synchronize your bookmarks and Speed Dial with a Desktop PC or other mobile phone. Try Opera Mini today; it is completely free. Price: Free; iTunes account required.